The Peterman Reality Tour is making a stop at Coca-Cola Field on Saturday, August 5. Join us for 2nd annual Seinfeld Night at the ballpark as the Bisons host the Lehigh Valley IronPigs at 7:05 p.m. (Gates: 6 pm), presented by Amherst Security Professionals. This year, our special guest is coming all the way from Burma (you may know it as Myanmar)…none other than J. Peterman himself, actor John O'Hurley. CLICK HERE FOR TICKETS | *Note: Pizza Bagel and 3 Musketeers sold separately. Bust out your favorite urban sombreros and Russian sable hats and get to the ballpark. O'Hurley will sign Autographs in the concourse for an hour after the game's first pitch (one item per person, no photographs). And that's AFTER he performs the national anthem before the Bisons contest against the IronPigs. Seinfeld Night also includes trivia and special contests from the hit TV show during the game as well as postgame Fireworks. 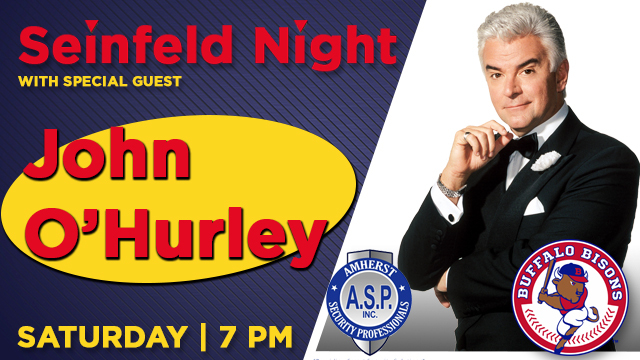 No need to travel all the way to a castle in Windsor, Seinfeld night on Saturday is right here at Coca-Cola Field! And we promise it's going to be a ripping good yarn!